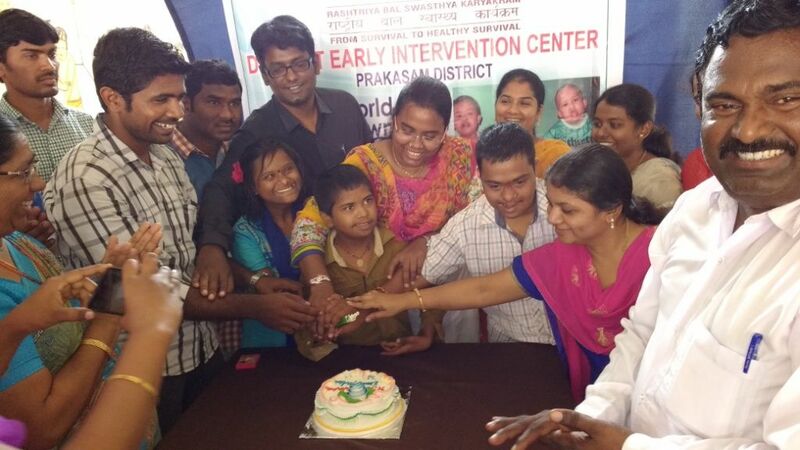 Early Intervention & Rehabilitation Center for Intellectual & Developmental Disabilities”, Kakinada run by Uma Educational & Technical Society (Uma Manovikasa Kendram), Kakinada partial support with Nagarjuna Foundation Hyderabad, We are extending services for Education, Rehabilitation, Social Justice & Empowerment of children with special needs and playing key role in prevention or minimization of impact of disability. The main objects of these special schools are to provide Educational & Rehabilitation services to the children with delayed developmental and intellectual disabilities. The following are the services providing to the beneficiaries at these centers. Parents counseling and guidance etc. During the year 2017-18 there are 90 such children studying, out of whom 40 are day care students. The other 50 are hostellers. The institute provides conveyance to and fro facility to the day care students to bring and drop from their residences. This organization is running a Special School for the Children with Intellectual Disabilities at Yanam, Puducherry (Union Territory of India)” with the support of Department of Empowerment of Persons with Disabilities (Divyangjan), Ministry of Social Justice and Empowerment, Govt. of India It would also ensure Apart from the Special Education, Social acceptance, respect their inherent dignity, individual autonomy and sense of belonging through the sensitization and awareness programmes. The following are the main Activities of the Centre. Kiddy bank, Group therapy, Yoga & Playing Activities etc. The State learning Centre for Deaf blind, in Andhra Pradesh has started functioning through UETS, Kakinada from 1st April 2012 with the support of DFID- GPAF and Sense International (India).This project exclusively meant to provide Rehabilitation services for Deaf blind /MSI persons. 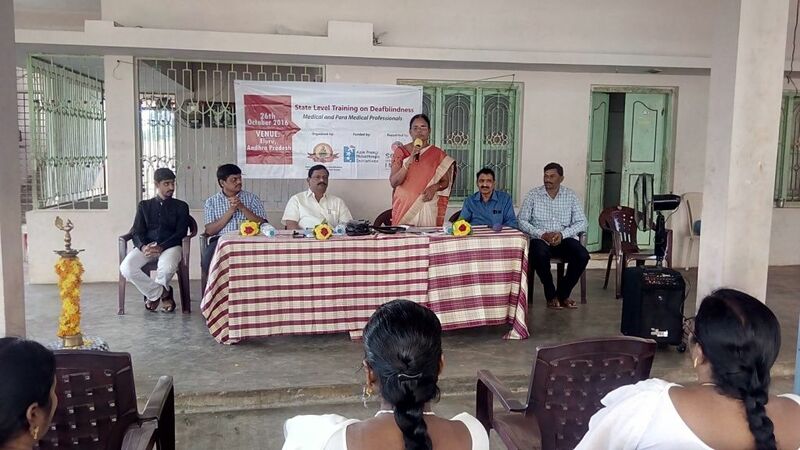 To create awareness on Deafblindness throughout Andhra Pradesh by conducting Seminars, Workshop etc. To organize awareness workshops/Seminars to the parents of Deaf blind children to enable them to train their children at home and to build up confidence among the parents of such children. To provide Rehabilitation services for Deaf blind persons. Comprehensive Clinical and Functional Assessment. Providing Medical and Nutritional support. To create Awareness among the people about disabilities. Survey & identification of persons with disabilities through camp approach. Early identification and Early Intervention. Providing/fitment of assistive devices &follow up/repair & Maintenance of assistive devices. Facilitation of SADAREM Medical certificates. In order to implement the Services of DDRC, a District Management Team was formed for which the District Collector & Magistrate, East Godavari District is the Chairperson, while Assistant Director (Welfare of Differently abled & Senior Citizens) is the Nodal Officer on behalf of District management Team and Executive Director, UETS, Kakinada is the Implementing Agency for which Sri. S.P. Reddy, Executive Director is the Nodal officer and the other District Officers namely District Educational Officer, District Medical & Health Officer, Project Officer (Rajiv Vidya Mission –SSA), District Sports Officer, District Employment Officer, Project Director (DRDA), and Project Director (Women & Child Welfare) Department East Godavari District are the members. The District Management Team reviews the work of the DDRC periodically and advises accordingly wherever it is necessary. The District Disabilities Rehabilitation Centre is fully equipped with the latest therapeutic equipment and delivering the services for the cause of action for the persons with disabilities at center. Individualized Counseling – 380, Provided Medicines to the Persons with Mental Illness – 50, Pulse Polio Immunized to 2176 children, Computerized Disability Certificate (SADAREM) – 303, Identified for Corrective Surgeries – 12. Home Based Training – 189, Early Intervention services to the children with disabilities – 44, Educational Scholarships – 34, Enrolled Children with disabilities in Anganwadi & Primary Schools – 175, Workshop to parents for skill up-gradation- 78, Awareness created on disability and schemes to school teacher – 115. Promoted Extra Curricular Activities to 159 children with disabilities, 45 PWDs benefitted under Poverty reduction scheme, 85 PWDs got Disability Allowance, 805 PWDs have participated in World disabled day celebrations. 607 PWDs have participated in Capacity building & Leadership Trainings, 10 DPOs could get loan for Income Generation Activity through project for self-employment, 489 PWDs are Aware about the Rights & Advocacy, 92 Disabled People’s Organizations are formed, 62 Disabled people’s Organizations opened bank accounts, 36 DPOs had linkage with Government department (IKP-DRDA), 28 DPOs could get financial support with Government department (IKP-DRDA). 12 Capacity building & monthly review meetings conducted 147 PWDs attended. 18 Advocacy and General Body meetings conducted 521 PWDs attended. 205 PwMI persons were provided medical service from govt. hospitals. 34 GB members attended the training and gained knowledge on local fund raising. 4 MDPOs have mobilized individual fund raising in the range of Rs, 20,000/- to 60,000/-. DDPO leaders participated in five RDPO trainings / meetings. East Godavari District in Andhra Pradesh is in the Bay of Bengal having goof potentiality for getting daily labor jobs due to agricultural, industrial, fishing and other labor work skilled and unskilled. To meet the labor requirement many people are getting migrated for their livelihood and survival. There is every possibility of spreading over any Sexual Diseases due to the Migration from vulnerable group who are coming alone and at risk persons who are establishing their setup. Since the disease should not spread over to other community, target intervention is most essential on the part of migrants. Therefore the main strategy is not to affect such diseases hence target intervention is required. To increase the awareness among the 15,000 Migrants in the Target area. To reduce the STIs among the 15,000 Migrants in the Target area. To increase Health seeking behavior among 15,000 Migrants in the Target area. To increase Condom usage among 15,000 Migrants. To increase enabling environment among Migrant Workers in the Target area. To increase access to other HIV basic services among Migrants. Referral System for STIs / ICTC / PPTC / RNTCP / CCC etc. Childline India Foundation (CIF) is the nodal agency of the Union Ministry of Women and Child Development acting as the parent organization for setting up, managing and monitoring the Childline 1098 services all over the country. M/s CIF has awarded the same to UETS as Collaborative Organization at Yanam for implementing the Childline 1098 activities. The following are the training and outreach programmes conducted to educate the public on Chlidline Activities. 32 Training programmes at community level. 21 School outreach programmes in various schools. 55 Street outreach programmes on Prohibition of Child Marriage Act 2006. 30 Outreach programmes for Self Help Group Members. 11 Training Programme for Health Workers, Bala Bhavan Workers, ICDS etc. 25 Outreach programmes at Bus Stand, Yanam to facilitate in & out flow passengers. Childline Se Dosti Week Programmes etc.